Epicor offers end-to-end, industry-specific enterprise resource planning (ERP) software solutions designed to meet the needs of manufacturing, distribution, retail, and services industries. Epicor ERP provides integrated solutions for customer relationship management (CRM), manufacturing operations, supply chain management (SCM), sales management (SM), financial management, and human capital management (HCM), among others. 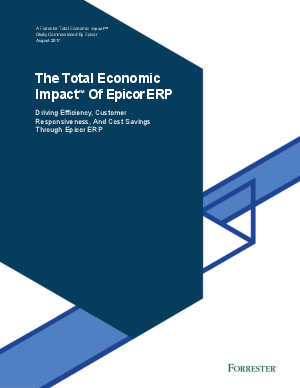 Epicor commissioned Forrester Consulting to conduct a Total Economic Impact™ (TEI) study and examine the potential return on investment (ROI) enterprises may realize by deploying Epicor ERP. The purpose of this study is to provide readers with a framework to evaluate the potential financial impact of the Epicor ERP solution on their organizations.